Did you know that, for the first time, the Empire State Building has turned its lights teal in honor of Food Allergy Awareness Week? That would be exciting any year, but it has special meaning for Katherine and me this year as we just returned from a wonderful (allergic-reaction free!) marching band trip to NYC. In celebration of Food Allergy Awareness Week and The Big Apple, we’d like to share a favorite Cinnamon Streusel Dessert Pizza recipe. This is a great food allergy recipe for us as the allergic people we cook for most often have dairy, nut and red dye allergies – all three of which are common in sweets. This dessert pizza is a free-from festive treat they can all enjoy. We make pizza or pepperoni rolls at least once a month, sometimes more. 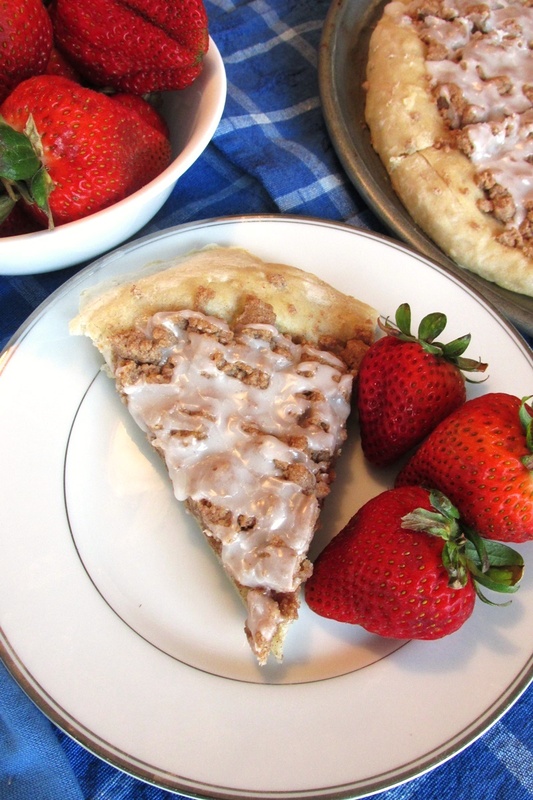 Lately we’ve been setting aside one portion of the pizza dough to make this cinnamon streusel dessert pizza. It’s just like the pizza chains make, except quicker, cheaper, healthier, and allergy friendly! I get especially excited when we can recreate an off-limits restaurant treat at home. This sweet treat makes family pizza night even more fun, and is easy for kids to make. In the directions we recommend mixing the streusel ingredients with a pastry cutter or fork, but most young helpers enjoy mixing the streusel with their hands before sprinkling it on the pizza crust. Glaze whisking and drizzling is another easy job for very young chefs. 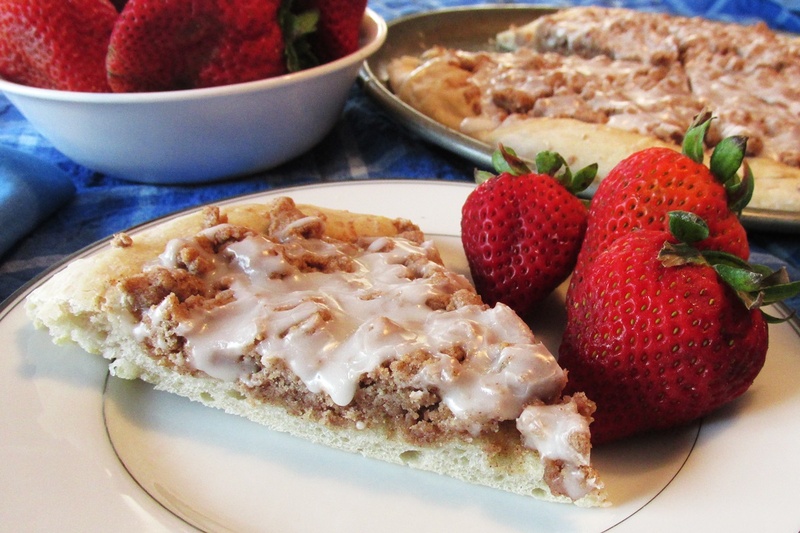 Leftovers of this cinnamon streusel dessert pizza make a great coffee cake with your morning cup. In fact, Katherine often bakes up two pizzas at a time, one for dessert and one for a special breakfast. Also, if you make our six-crust pizza dough just for this recipe, the remaining dough portions freeze well. Then you can grab a crust for a dessert pizza anytime you like! By ingredients, this recipe is dairy-free / non-dairy, egg-free, optionally gluten-free, nut-free, peanut-free, optionally soy-free, vegan / plant-based, and vegetarian. We use a wheat based pizza dough, but you can make this dessert pizza gluten-free with your favorite gluten-free, dairy-free pizza crust and by using gluten-free, dairy-free all-purpose flour in place of the regular all-purpose flour in the streusel. For the Pizza, preheat your oven to 350ºF and grease a pizza pan. Stretch the pizza dough to fit the pizza pan, making the dough as even as possible. Combine the flour, sugar, and cinnamon in a bowl. Cut in the buttery spread with a pastry cutter or fork until the mixture resembles coarse crumbs. Evenly spread the streusel mixture over the pizza crust. Remove from the oven and let cool slightly, still in the pan, on a cooling rack. For the Glaze, whisk together the powdered sugar and milk until smooth. Drizzle the glaze over the warm pizza. Cut the pizza into eight wedges to serve. Alisa we are not gluten free just dairy and egg free I just now seen the link to your pizza dough. I am gonna try the one you have on here he does not like the store bought one,also very expensive! Thank you ? Looks so good. The only dairy free pizza crust that I have found was enjoy life pizza crust. My son does not like the taste of the dough. Any suggestions on something that tast different that he might like, or something I can do with the dough to give it a different flavor that he will like? Amber, most pizza doughs (recipes and store-bought) are dairy-free. Trader Joe’s actually sells three ready-to-bake versions that are kosher parve. Also, there is a link in the recipe to the homemade version (very easy!) used in this recipe – you don’t need to buy it. Are you looking or gluten-free specifically? This would be delicious with some fruit between the crust and topping. I am going to add some thinly sliced apples under the topping. Also, you can make a delicious vegan pie crust using coconut oil in place of butter. Mmmm. Thanks for the recipe! 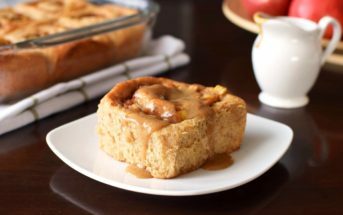 Yes, apple cinnamon streusel would certainly be delish! Oh my goodness, Alisa! This looks incredible! Oh man, I haven’t had dessert pizza since college. I bet this one is WAY better than the one I used to get on campus! Yep, I’m betting it’s much better, too!